64 October/November 2018 unmanned systems inside AIR EMERGENCY RESPONSE A few years ago, Bob Goldstein, CEO of US Nuclear Corp., came to FlyCam UAV with an idea. He wanted to mount his ra- diation detection devices to unmanned aircraf t systems (UA S), enabling hazmat teams to detect radiation in real time without ever being put into potentially dangerous situations. 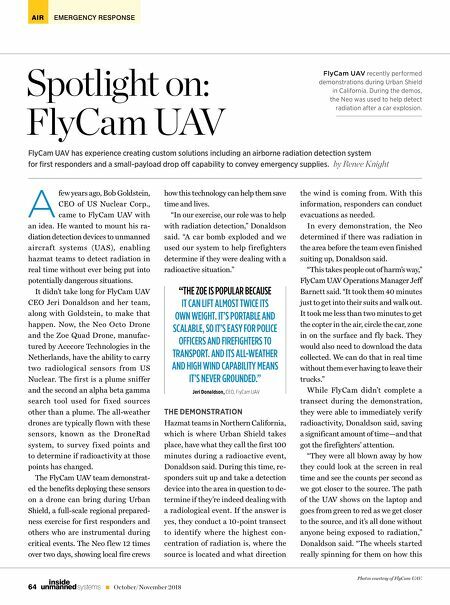 It didn't take long for FlyCam UAV CEO Jeri Donaldson and her team, along with Goldstein, to make that happen. Now, the Neo Octo Drone and the Zoe Quad Drone, manufac- tured by Acecore Technologies in the Netherlands, have the ability to carry two radiological sensors from US Nuclear. The first is a plume sniffer and the second an alpha beta gamma search tool used for f ixed sources other than a plume. The all-weather drones are typically f lown with these sensors, know n as the DroneRad system, to survey f ixed points and to determine if radioactivity at those points has changed. The FlyCam UAV team demonstrat- ed the benefits deploying these sensors on a drone can bring during Urban Shield, a full-scale regional prepared- ness exercise for first responders and others who are instrumental during critical events. The Neo f lew 12 times over two days, showing local fire crews Photos courtesy of FlyCam UAV. how this technology can help them save time and lives. "In our exercise, our role was to help with radiation detection," Donaldson said. "A car bomb exploded and we used our system to help firefighters determine if they were dealing with a radioactive situation." THE DEMONSTRATION Hazmat teams in Northern California, which is where Urban Shield takes place, have what they call the first 100 minutes during a radioactive event, Donaldson said. During this time, re- sponders suit up and take a detection device into the area in question to de- termine if they're indeed dealing with a radiological event. If the answer is yes, they conduct a 10-point transect to identif y where the highest con- centration of radiation is, where the source is located and what direction FlyCam UAV has experience creating custom solutions including an airborne radiation detection system for first responders and a small-payload drop o capability to convey emergency supplies. Spotlight on: FlyCam UAV by Renee Knight the wind is coming from. With this information, responders can conduct evacuations as needed. In every demonstration, the Neo determined if there was radiation in the area before the team even finished suiting up, Donaldson said. "This takes people out of harm's way," FlyCam UAV Operations Manager Jeff Barnett said. "It took them 40 minutes just to get into their suits and walk out. It took me less than two minutes to get the copter in the air, circle the car, zone in on the surface and f ly back. They would also need to download the data collected. We can do that in real time without them ever having to leave their trucks." While FlyCam didn't complete a transect during the demonstration, they were able to immediately verify radioactivity, Donaldson said, saving a significant amount of time—and that got the firefighters' attention. "They were all blown away by how they could look at the screen in real time and see the counts per second as we got closer to the source. The path of the UAV shows on the laptop and goes from green to red as we get closer to the source, and it's all done without anyone being exposed to radiation," Donaldson said. "The wheels started really spinning for them on how this "THE ZOE IS POPULAR BECAUSE IT CAN LIFT ALMOST TWICE ITS OWN WEIGHT. IT'S PORTABLE AND SCALABLE, SO IT'S EASY FOR POLICE OFFICERS AND FIREFIGHTERS TO TRANSPORT. AND ITS ALL-WEATHER AND HIGH WIND CAPABILITY MEANS IT'S NEVER GROUNDED." 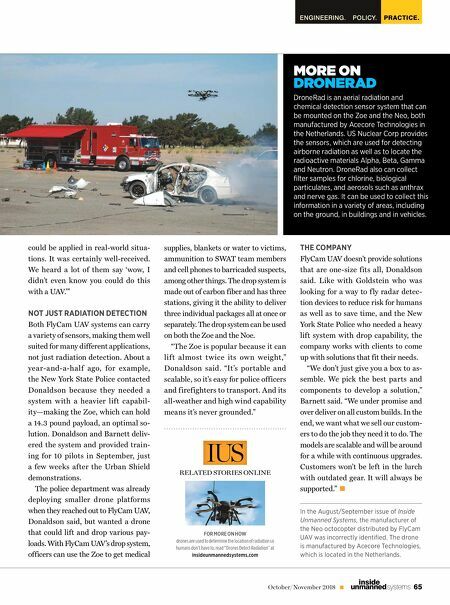 Jeri Donaldson, CEO, FlyCam UAV FlyCam UAV recently performed demonstrations during Urban Shield in California. During the demos, the Neo was used to help detect radiation after a car explosion.